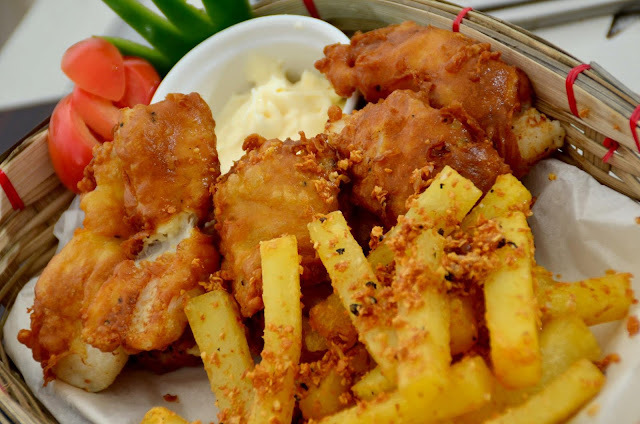 Fish and chips is deep-fried fish in batter with deep-fried potatoes, and a popular take-away food. Fish and chips started as meager street food first sold in the 1850s. Both Lancashire and London stake a claim to the origin of the meal. Cod is the most popular fish sold in fish and chips shops, though haddock and other whitefish species such as plaice, hake and whiting are also popular. 1. Place potatoes in a medium-size bowl of cold water. In a separate medium-size mixing bowl, mix together flour, baking powder, salt, and pepper. 2. Stir in the milk and egg; stir until the mixture is smooth. Let mixture stand for 20 minutes. 3. Preheat the oil in a large pot or electric skillet to 350 degrees F (175 degrees C). 4. Fry the potatoes in the hot oil until they are tender. Drain them on paper towels. 5. Dredge the fish in the batter, one piece at a time, and place them in the hot oil. Fry until the fish is golden brown. 6. If necessary, increase the heat to maintain the 350 degrees F (175 degrees C) temperature. Drain well on paper towels. 7. Fry the potatoes again for 1 to 2 minutes for added crispness.